he Corolla''''''''s four-cylinder engine is tried and true but pretty underwhelming. Acceleration is adequate and not much more. The LE Eco''''''''s engine adds a few horsepower, but not enough to notice. The CVT has computer-simulated shifts to mitigate the constant rpm drone common to these types of transmissions. That drone can rear its head, however, when you switch into Sport mode. The Corolla''''''''s handling, too, is familiar. Sporty SE trim touches notwithstanding, there''''''''s no real playfulness present. Any attempt at spirited driving on a twisty road is met with lifeless steering and noticeable body roll. On the upside, the Corolla is all about no-hassle commuting comfort. The ride is compliant and shakes off most of what the road can throw at you. A floaty luxury sedan it isn''''''''t, but for a compact car it''''''''s impressive. 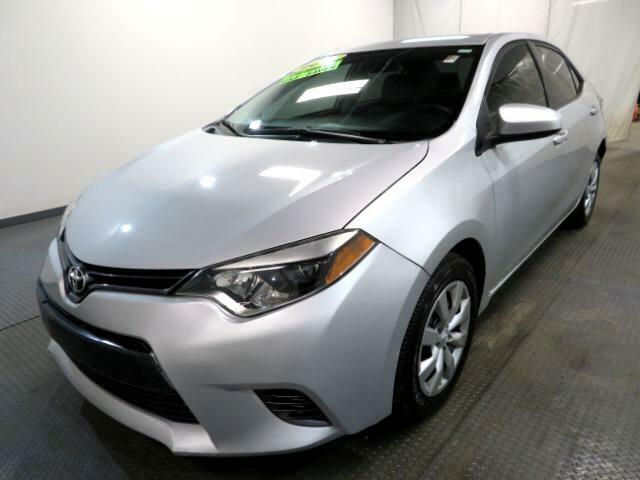 If that describes your daily driving needs, the 2015 Toyota Corolla can make the daily grind seem less onerous. ***Internet special. Price reflects discount for cash buyers. Traditional and special financing is available for qualified buyers. Please contact us first for availability as our cars go fast at near wholesale prices. Prices are subject to change. Sales Tax, Title, License Fee, Registration Fee, Dealer Documentary Fee, Finance Charges, Emission Testing Fees and Compliance Fees are additional to the advertised price. All options and condition of the vehicles must be verified with the dealer, any descriptions or options that are listed maybe incorrect due to automatic data transfer.